"When I saw that Clutter actually put out another game, I didn't think it would be possible to top all their previous games. I mean what more could they even think of to be different? Well, truth be told, Clutter 1000 has come up with an unbelievable amount of new clutter! They are even showing the items in all sorts of crazy ways. I am having so much fun with this game, that it's almost impossible for me to stop and get any housework done. I am already so addicted that I can't get to bed at a decent time anymore. My husband kiddingly told me the other day that If I spend any more time playing this game, our own house is going to turn to Clutter!" 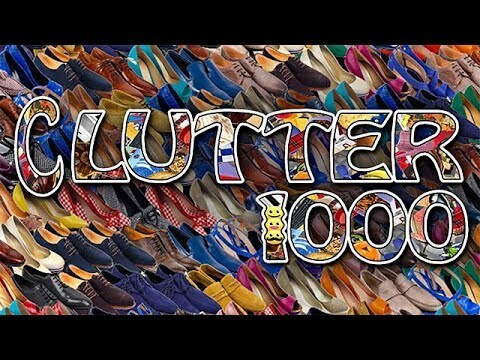 It's the most addicting Un-Hidden Object game you will ever play, and Clutter 1000 is definitely the best Clutter of them all. The object of the game is as simple as can be. Just find and click on two matching objects to remove them from the playing field. Watch your pairs pop out and merge into one, then swoop down to the treadmill. All your old favorites are here along with twice as many new ones to keep you playing for days and days. With 1000 puzzles in all, there are too many amazing levels to describe. Be warned, as Clutter 1000 may become your most addicting daily puzzler. I've purchased every Clutter game there is, and this one is by far my favorite. It has a lot more things to unclutter like emojis and such. I would recommend this game to anyone. I love the Clutter series! I've been waiting for the newest one to come out. They're the best games I have ever played. The challenge and the eye for all of the different games is awesome. Don't stop creating them. They're the best! I love this game. It's a good game to sit and waste time. The puzzles are fun. Some are pretty easy, but there are ones that I could not solve in the allotted amount of time. I like the choice of being able to skip that puzzle and come back later. I like all the Clutter games, and was really excited when a new one out and could hardly wait to play it. I would recommend it for all ages. Like it? Loved it -- This is by far the best Clutter game, and I have them all. If you need a break from life, get this game and play. I like it because you have to match two things. Requires concentration and to pay attention to details and colors. I hope in the future they have more of this type of game. I love most of the Clutter games. This is just different enough that it grabbed my attention.